a consistent, orderly, or pleasing arrangement of parts; congruity. which is an uncomfortable thought. Once you understand what is not within your control then you can focus your energy and attention on what you can. 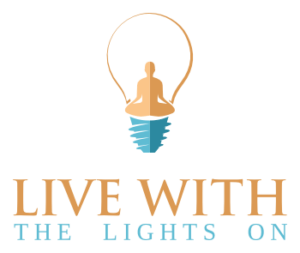 Live With The Lights On”s excels at bringing harmony and resilience through Katy Bray’s intuition and unique expertise in Ayurveda, yoga, meditation, integrative nutrition, and coaching. By focusing on harmony and resilience with you then you’ll have what it takes to overcome that obstacle you’re facing in your life. Katy is brilliant helping others develop their intuition and here’s why whoever helps your intuition should be extremely clear in “seeing” you so they can give you feedback on what is clear intuition and what is colored by another aspect. Very few people have this level of clarity. One of the many skills Katy uses with clients is empathically reading exactly what they are seeing or feeling. How powerful is that! Ayurveda is a brilliant ancient system originating in India and is considered the “only” systems approach to health. It’s also the only whole person system who’s goal is vitality, anything less leads to disease. Katy and her husband Zeb Severson enjoy working with couples, families, and coworkers understand themselves through Ayurveda which leads to understanding others at a deeper level. In western culture, a lot of help is needed for anyone wanting to stay balanced. One fault of niche markets and specialization is a lack of integrated comprehensive support for individuals. Just yoga, meditation, eating right, vacation isn’t effective enough for most people. Ayurveda meets everyone at their level with a vast set of tools to stay in harmony by their own natural rhythms. She gets 5 stars from me!!! working with Katy is the most impactful step you can take for yourself. What are the results of having harmony and resilience in your life?